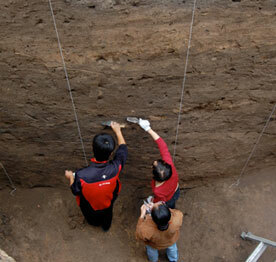 Archaeology is a subfield of anthropology that examines the human past through material remains. From artifacts found with fossilized remains of our earliest human ancestors in Africa dating to millions of years ago, to historical buildings in urban or rural Oregon, archaeology analyzes the physical remains of the past in pursuit of a broad and comprehensive understanding of human cultures. At the University of Oregon, archaeology is practiced by a diverse group of faculty and students working in North America, the Pacific Rim, Pacific Islands, Caribbean, Southeast Asia, East Asia, and Sub-Saharan Africa. We study a broad array of topics, including settlement of the Americas, colonization and population dispersals, the archaeology and historical ecology of islands and coastal regions, fishing societies, transitions to agriculture, and emergence of social inequality. We examine the effects of economic, environmental, cultural, and evolutionary factors on subsistence, social structure, ethnicity, identity, and gender in archaeological contexts, and how humans adapted, influenced, and altered their natural and social environments. We work on issues surrounding the management of archaeological sites and cultural heritage, and the relationship between indigenous and minoritized groups in archaeology. We foster indigenous scholarship and promote collaborative relationships with tribal and local community stakeholders. Collecting soil samples for archaeobotanical analysis at the Yangshao (Neolithic) period Yanggwanzhai site, Shaanxi province, as part of Dr. Gyoung-Ah Lee’s research.